Our operatives are highly skilled in accessing difficult to reach areas and providing a comprehensive clean. In addition to our cleaning services, Tecmaster are also experienced in the supply, installation and repair of both access panels and ductwork. 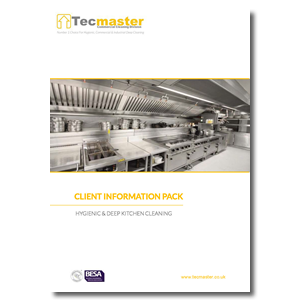 As a result of the Fire Risk related to Commercial Kitchen Extraction Systems, insurance companies require businesses to perform Deep Cleans to their Extraction Systems to ensure the build-up of grease is kept to a minimum. The frequency of the clean is dependent on the type of cooking and the service hours per day. Our Survey Team can provide a recommendation of clean frequency based on guidance from the HSE. This will detail the regularity of your Deep Clean and if any improvements can be made to enable better access to your extraction system. We will also advise on additional solutions such as regular filter cleans to improve the productivity of your Extraction System.